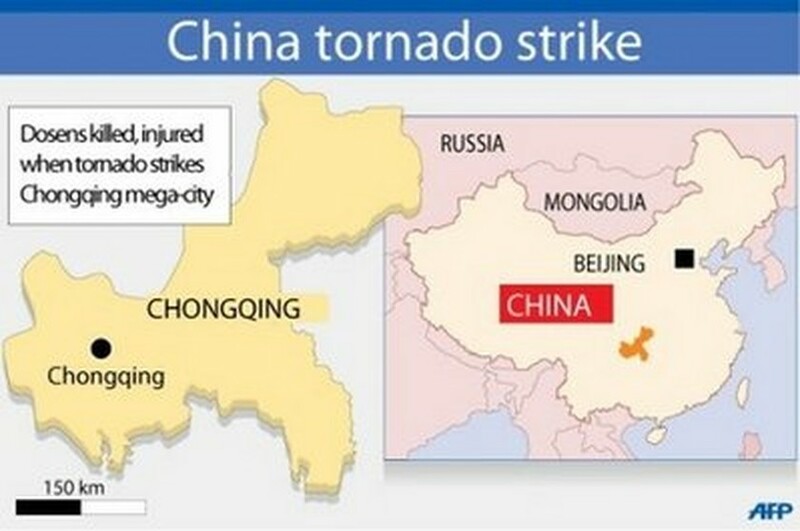 At least 23 people were killed and more than 160 injured when a tornado struck China's southwestern mega-city of Chongqing Thursday, smashing homes and destroying crops, officials and state media said. The tornado -- followed by torrential rains, hail storms and high winds -- hit two rural counties in the giant municipality at around 2:00 am (1800 GMT Wednesday), Xinhua news agency said, citing government sources. Officials were working to tally the number of dead and injured, as well as the number of homes damaged. "Tornados never happened here in the past -- this is the first time," Liu Fang, a local township official in Liangping county, one of the hardest-hit areas, told AFP by phone. "So far, six have died and 38 are injured in our township. The electricity has been cut, and some houses were damaged due to the strong wind. We're still gathering information on the toll." The injured were being brought to local hospitals while tents were being set up for those whose homes were destroyed, Li said. Torrential rains have been falling over the region since the tornado struck, he added. "Basically, collapses to old houses was very serious, while newly built brick homes were only damaged," an official in Xinmin township told AFP. "We're still gathering information about the disaster." According to the People's Daily, the Communist Party's mouthpiece, as many as 1,000 homes in six towns had at least partially collapsed in the storm, while thousands of others were damaged. Power was cut in several areas, many roads in the region were blocked, and bridges also suffered damage, the report said. The cost of damage in the six towns was expected to surpass 20 million yuan (almost three million dollars), it added, citing preliminary estimates. Chongqing has a population of more than 30 million people.